Up on the Bianchi Dolomiti! 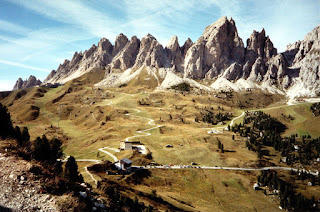 When you think of the Italian Dolomites, how about the famed Passo Gardena? I can just see Fausto Coppi on his beloved Bianchi scaling up the beautiful Dolomites. He would be so envious! 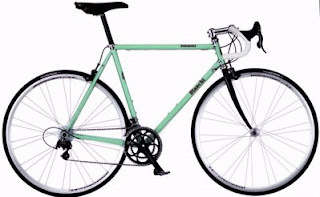 One hundred and twenty-four year old bike manufacturer, Bianchi is planning to launch for 2009, a retro beauty called, 'The Dolomiti.' A chrome-lugged celeste painted, steel frame complete with retro 50's Bianchi logo's! Apparently, Campagnolo Veloce 10 speed will be the offered gruppo. I checked the price and one could 'fork' over around $2100.00 USD(frame & carbon fork only). The popular steel fork may be offered. And it should be. No respecting steel frame should be seen without one! There seems to be more choices out there as Bianchi moves into the steel market. The classic Italian. I'm cheering with the azzurri, I couldn't be happier! Superb blogOrama, dude! But, yet, Al-Quida doesn’t like my avant-garde blog. Could you tell me Y? I am lucky enough to have recently purchased and had built up the De Rosa Neo Primato. I have to say its such a comfortable and classy ride after having been used to riding a Cannondale aluminium frame for such a long time. Its a head turner too. Love the chromed lugs of the Bianchi, very tasty!